Malaysia’s pay-TV operator and broadcaster Astro is rumored to be going private. The speculations first started approximately a week ago when The Star reported that its billionaire founder, Ananda Krishnan is pondering on the possibility of taking Astro Malaysia Holdings Bhd private again. The company first became public in October 2003 as Astro All Asia Networks, but was taken private in June 2010. 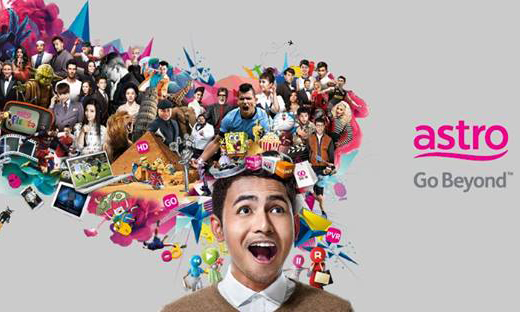 It was then listed again on 19 October 2012 as Astro Malaysia Holdings. The Star also reported that, according to its industry sources, Ananda who owns 40% of Astro, is looking at a corporate exercise to buy out the rest of the shares in the company. This is via his private vehicle company Usaha Tegas. In addition, it said the exercise is still in preliminary stages and that Usaha Tegas feels that the market is not valuing the company fairly. Coupled with Ananda’s previous style of delisting and relisting other companies under his stable such as Maxis and Bumi Armada, it probably will not shock industry players as much – if he is indeed going to delist Astro once again. Experts that A+M spoke to are pretty upbeat about its privatisation, that is – if it does happen. Ranga Somanathan, newly appointed CEO of Omnicom Media Group of Singapore and Malaysia said that Astro’s privatisation will enable the company to reinvest its revenue towards future proofing. It will also ease the management of any distractions from the investors and focus all its energies on its customers. Privisation process is a growing pain, Rajesh Mahtani, head of business development and brand communications of Asia Pacific at Publicis Groupe Media said. He added that while it is a higher risk to take, it can potentially bring positive benefits for Astro’s business as a whole with more leeway to try new things and make faster decisions to come up with a new business idea. Public listed companies are often handcuffed with more obligations to follow such as internal staffing and policies. It’s clear that the market undervalues Astro. I believe that Astro has some fundamental strength that can be leveraged into new platforms and new commercial models to deliver sustained performance. Also sharing the same sentiment is, Ivan Wong, commercial director of SPH Magazines in Singapore. He said that without having to be concerned over the impact to shareholders and short term business targets, privatisation could actually free Astro to develop longer term strategies and pivot more nimbly to grasp opportunities. Wong added, without the statutory shackles, Astro could likely operate and innovate more as a startup. With more freedom, we may see Astro hiring more talents in boosting up various teams especially in the digital and tech space. Prashant too, agreed with Wong as he does not see a major impact on advertising revenue growth trend. The critical thing about privatisation is, to change your behavior and adjust to the new environment and system, said Mahtani. That said, one of the challenges Astro faces, apart from a weaker ringgit, is also the increasing competition from upcoming video-on-demand (VOD) service providers such as Netflix, iflix, Viu and most recently, the newly launched Dimsum by Star Media group. With seismic shifts in audience viewing habits and robust competition in new ways of distributing content, Somanathan also said, it will be critical for Astro to invest in data and tech to stay ahead and stay relevant. Somanathan added that if Astro gets it’s formula right, the investments in data, tech and new licensing models will not only enable the company to endear itself to the Malaysian consumers, it will also help in market expansion and wider footprint across the region. Living in a small house? Pricerite and actress Karena Lam say it doesn't matter, and encourage Hongkongers to ‘live on the bright ..